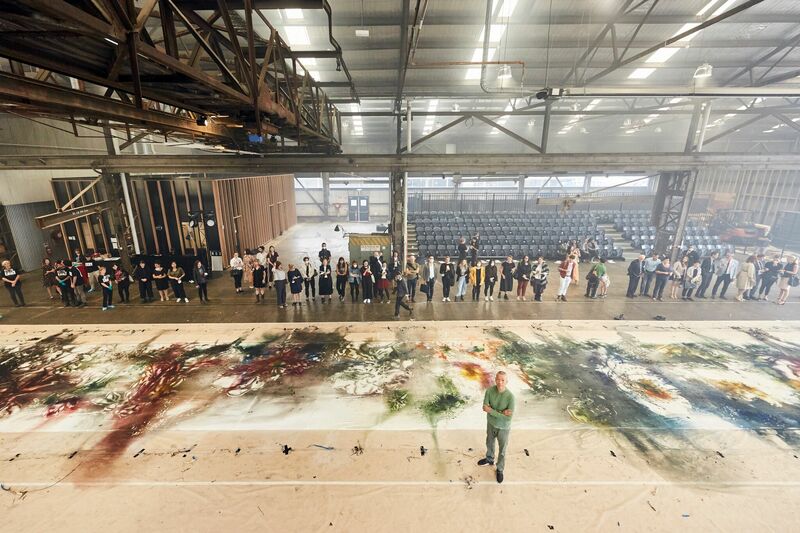 Wednesday 20 March: Today, in a explosive display, one of the world’s most dynamic contemporary artists currently working, Cai Guo-Qiang, created a gunpowder drawing Transience II (Peony) in Melbourne. The 31meter art work created from fire and gunpowder is the largest of three works presented as part of the Melbourne Winter Masterpieces, opening at NGV International, 24 May. Located in a Williamstown warehouse, Cai drew complex patterns in gunpowder, layered upon 11 sections of silk before igniting it. The designed explosion scorches the intricate patterns onto the silk canvas, depicting the blooming process of the peony flower in reference to ancient Chinese culture. Inspired by ancient Chinese culture and its enduring philosophical traditions, Cai has created all new works including Transience II for the NGV’s world premiere exhibition, CaiGuo-Qiang: The Transient Landscape presented in parallel with Terracotta Warriors: Guardians of Immortality. The exhibition will also feature a sculpture of porcelain peonies as well as a monumental installation of 10,000 suspended porcelain birds. Spiralling over visitors’ heads, the birds create a three-dimensional impression of a calligraphic drawing of the sacred Mount Li, the site of the ancient tomb of China’s first emperor, Qin Shihuang, and his warriors. Cai will also collaborate on the exhibition’s design, creating immersive environments for the presentation of both his work and the Terracotta Warriors. Presented in parallel, Terracotta Warriors: Guardians of Immortality is a large-scale presentation of the Qin Emperor’s Terracotta Warriors, which, discovered in 1974 in China’s Shaanxi province, are regarded as one of the greatest archaeological finds of the twentieth century and widely described as the eighth wonder of the world. The exhibition will feature eight warrior figures and two life-size horses from the Imperial Army, as well as two half-size replica bronze chariots, each drawn by four horses. The Melbourne Winter Masterpieces presentation of Terracotta Warriors: Guardians of Immortality and Cai Guo-Qiang: The Transient Landscape will be on display from 24 May 2019 – 13 October 2019 at NGV International, 180 St Kilda Road, Melbourne, Australia. Tickets and information are available from the NGV website NGV.MELBOURNE.